A voter casts a ballot Cleveland on Election Day. 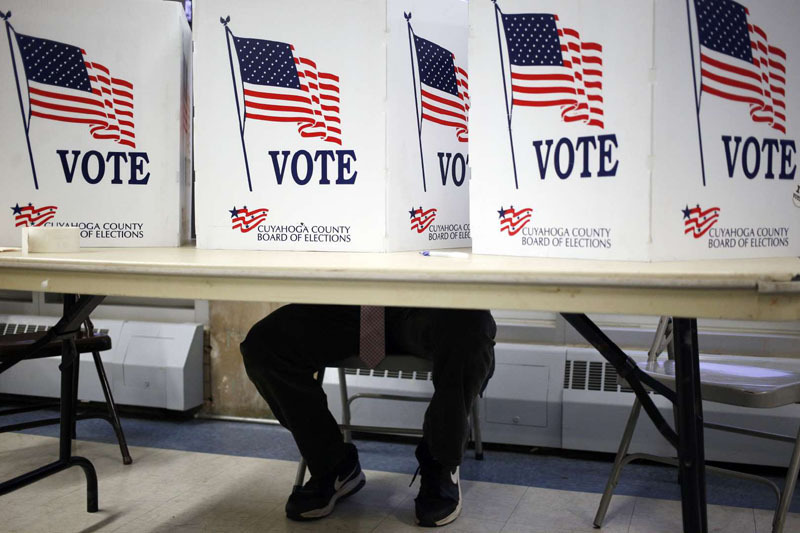 Primary voters in four states will head to the polls on Tuesday ahead of the November mid-term elections. The voting in Ohio, Indiana, North Carolina and West Virginia come as Democrats try to wrest control of the U.S. House of Representatives while Republicans try to hold onto their majority and potentially pick up Senate seats. West Virginia’s Senate primary may be the most closely watched of the May 8 primaries, and that’s because of former Massey Energy CEO Don Blankenship. After an explosion at Massey’s Upper Big Branch Mine in 2010 killed 29 miners, he spent a year in federal prison after a federal jury convicted him of conspiring to violate mine safety and health standards. On Monday morning, President Donald Trump tweeted to ask West Virginia voters to steer clear of Blankenship and instead vote for his opponents, saying Blankenship “can’t win the General Election in your State…No way!” Trump also said “Remember Alabama,” invoking Roy Moore’s primary victory in Alabama and eventual loss in the general election after multiple women accused him of sexual misconduct. The House primary races to watch, according to Vox, are in the 1st, 7th, 10th, 12th, 14th, and 15th Congressional districts that Democrats are trying to flip from Republican control. But the big races to watch are the U.S. Senate and the gubernatorial primaries. Democratic incumbent Sen. Sherrod Brown is up for reelection, and the May 8 primary will decide who the progressive Senator will face. There are two Republicans in the field: Rep. Jim Renacci—who Trump endorsed—versus businessman Mike Gibbons. On the Republican side, State Attorney General Mike DeWine is up against Lt Gov. Mary Taylor. On the Democratic side, the fight is between former Rep. Dennis Kucinich, and former head of the Consumer Financial Protection Bureau during the Obama administration Rich Cordray. Indiana is Vice President Mike Pence’s home state, which Trump won by 19 points in the 2016 general election. Eyeing his margin, the three Republican Senate candidates have clung close to Trump as they try to take out Democratic incumbent Sen. Joe Donnelly. They are Rep. Todd Rokita, Rep Luke Messer, and businessman and former Indiana State Rep. Mike Braun. This primary race has been called the “nation’s nastiest,” according to the Indianapolis Star, and it’s unclear who will win. Every 12 years, North Carolina has a Blue Moon election—or an election with no statewide races on the ballot—that translates into lower voter turnout. And 2018 is one of them. The primaries to watch, according to The Hill and Vox, are those deciding the Democratic challengers to incumbent Republican Reps. Richard Hudson, Robert Pittenger, Ted Budd, and George Holding.